In a week with little new data, the surprising upset in the general election dominated both headlines and financial market discussions. Equity markets initially reacted with shock at the election outcome, but after a few days, the Dow Jones Industrial Average hovered around a new all-time high. This extraordinary achievement in stock prices represented a sense of optimism following an extremely divisive campaign, helped along by gracious and conciliatory comments from the candidates themselves. For manufacturers, we hope that this renewed sense of unity encourages our nation’s leaders to enact pro-growth policies and to find solutions to our long-term challenges, as outlined in a letter released the day after the election to President-elect Donald Trump. Those policies include a series of priorities outlined earlier this year in the NAM’s “Competing to Win” document. Beyond the election, there were a few releases on the manufacturing labor market—one looking at the past and the other providing some possible encouragement for the future. The Business Employment Dynamics (BED) report said that net employment growth declined in the first quarter for the third consecutive quarter. The data are released with a two-quarter lag, so they are mostly a reminder of the pullback in hiring earlier this year. The BED release also found that start-up rates for new manufacturing establishments have continued to fall, with the rate of employees per start-up also easing. More positively, manufacturing job openings rose slightly, up from 326,000 in August to 334,000 in September. Openings have drifted lower since achieving an all-time high of 397,000 in April. Through the first three quarters of 2016, job openings have averaged 349,000 per month, up from 311,000 for 2015 as a whole. As such, we have continued to see relatively healthy gains in manufacturing job openings, despite some easing over the past few months. This gives us optimism for faster hiring growth moving forward. At the same time, hiring has remained quite soft despite elevated job opening rates, at least for now. Indeed, net hiring was barely positive in September, even as it marked the fourth consecutive month of net gains. Meanwhile, consumer confidence rebounded in November after falling to a 13-month low in October, according to preliminary data from the University of Michigan and Thomson Reuters. Note that this is a preliminary figure, and it will be interesting to see how the final data, which will be released on November 23, are impacted by the election results. The good news is that consumers appear to be more willing to use their credit cards when making purchases, moving on from some of the caution earlier in the year. U.S. consumer credit outstanding rose 6.7 percent at the annual rate in September. Across the past 12 months, consumer credit has increased 6.0 percent, with roughly equal gains for both revolving and nonrevolving credit lines. That mirrors stronger consumer spending data of late. At the same time, the Small Business Optimism Index from the National Federation of Independent Business increased to its highest level year to date but subdued relative to what we might prefer. Soft sales and earnings data help to provide an explanation for why small business owners are anxious, with respondents citing economic conditions and the political climate as a concern. Following the election outcome, it will interesting to see if that index shifts somewhat in terms of sentiment. This week, we will get a number of economic reports about the current health of the manufacturing sector. First and foremost, the Federal Reserve will release industrial production figures for October, and we will be looking for manufacturing production to build on the rebound in September data. With that said, output in the sector has been essentially stagnant year-over-year as manufacturers have struggled with global headwinds and economic uncertainties. We will be looking for an acceleration in that pace moving forward. In addition, there should be similar trends in the regional surveys from the Kansas City, New York and Philadelphia Federal Reserve Banks. Other highlights include the latest data on consumer and producer prices, housing starts and permits, the leading economic index, retail sales and state employment. P.S. : If you have not already done so, please take a moment to complete the latest NAM Manufacturers’ Outlook Survey. This 25-question survey will help us gauge how manufacturing sentiment has changed since September’s survey. The survey includes special questions on monetary policy, shareholder activism, infrastructure, supply chain management and your company's get-out-the-vote efforts. To complete the survey, click here. Responses are due by Monday, November 28, at 5:00 p.m. EST. As always, all responses are anonymous. The Bureau of Labor Statistics reported that net employment growth declined in the first quarter for the third consecutive quarter, according to the latest Business Employment Dynamics (BED) data. Note that BED data are released with a two-quarter lag, providing more detail about firm employment shifts by sector and by establishment size over time. Manufacturers had gross job gains of 377,000 in the first quarter, with 346,000 from expanding establishments and 31,000 from new establishments. At the same time, there were gross job losses of 403,000 in the quarter, with 361,000 from contracting establishments and 42,000 from closing establishments. Therefore, there was a net employment change of -26,000, falling further from the -11,000 change in the fourth quarter of 2015. The BED database continues to reflect reduced start-up rates for new manufacturing establishments over the longer term. There were 4,000 new manufacturing establishments in the first quarter, its lowest level since the third quarter of 2009. This was also down from the essentially 8,000-per-month pace in 1996, or two decades ago. 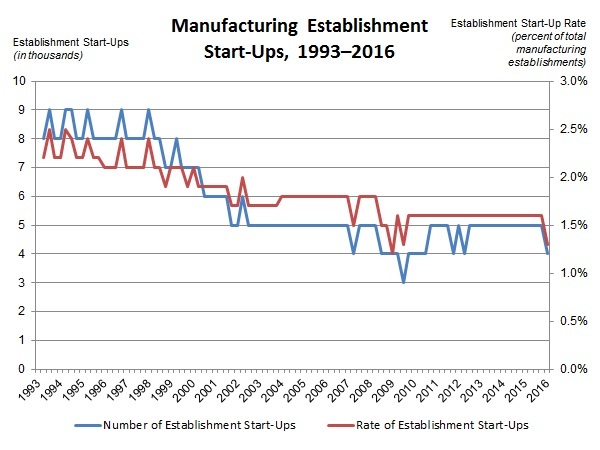 In addition, the rate of employees per start-up in manufacturing has also declined, down from an average of 94,000 employees from new establishments in 1996 to 19,000 in the first quarter of this year. Similar findings can be seen in other industries, with reduced entrepreneurship rates and smaller workforces per new start-up. The Federal Reserve Board reported that U.S. consumer credit outstanding rose 6.7 percent at the annual rate in September. Total consumer credit was $3.707 trillion, with $978.8 billion in revolving credit and $2.728 trillion in nonrevolving credit. Across the past 12 months, consumer credit has increased 6.0 percent, with roughly equal gains for both revolving and nonrevolving credit lines. Nonrevolving credit, which includes auto and student loans, increased 6.0 percent over that time frame. In addition, revolving credit, which includes credit cards and other credit lines, increased 5.9 percent year-over-year. That is notable because the pace of growth has accelerated across the past 12 months, up from 4.6 percent year-over-year growth in September 2015. That mirrors stronger consumer spending data of late. As such, Americans are more willing to use their credit cards when making purchases, moving on from some of the caution we saw earlier in the year. The Bureau of Labor Statistics reported that manufacturing job openings rose slightly, up from 326,000 in August to 334,000 in September. Openings have drifted lower since achieving an all-time high of 397,000 in April. Through the first three quarters of 2016, job openings have averaged 349,000 per month, up from 311,000 for 2015 as a whole. As such, we have continued to see relatively healthy gains in manufacturing job openings, despite some easing over the past few months. This gives us optimism for faster hiring growth moving forward. In the September data, durable goods firms had more openings, up from 185,000 to 205,000, but there were fewer postings among nondurable goods manufacturers, down from 141,000 to 130,000. Meanwhile, net hiring was barely positive in September, even as it marked the fourth consecutive month of net gains. This was an improvement after declines from February through May. Total hiring edged down from 274,000 to 269,000 in this release, but total separations, which include quits, layoffs and retirements, were unchanged at 268,000. Hiring increased for durable goods businesses, up from 152,000 to 159,000, but this was mostly offset by reduced hiring from nondurable goods firms, down from 122,000 to 110,000. Overall, net hiring (or hiring minus separations) equaled 1,000 in September, off from 13,000 in July and 6,000 in August. In the larger economy, nonfarm job openings inched up from 5,453,000 in August to 5,486,000 in September. Postings have largely trended in the right direction over the past year, but remain down from the all-time high of 5,831,000 in July. Job openings increased in every major sector in September except the following: government; leisure and hospitality; and transportation, warehousing and utilities. In addition, net hiring in the overall economy was strong but somewhat softer in this report, down from 216,000 in August to 167,000 in September. The National Federation of Independent Business reported that sentiment among small business owners edged marginally higher in October. The Small Business Optimism Index increased from 94.1 in September to 94.9 in October, its highest level year to date but subdued relative to what we might prefer. The headline index has averaged 94.5 over the past five months, representing some progress after falling to a two-year low in March (92.6). It was down from 96.0 one year ago, however, and small firms continue to be cautious in their economic outlook. The Optimism Index has remained below 100—the threshold suggesting more robust growth in the sector—for 22 straight months. Soft sales and earnings data help to explain why small business owners are anxious. The net percentage of survey respondents expecting higher sales in the next three months declined from 4 percent to 1 percent. The average for that measure year to date in 2016 has been 1.3 percent, down from 7.7 percent through all of 2015. At the same time, the percentage suggesting the next three months would be a good time to expand increased from 7 percent to 9 percent. Much like the sales figure, respondents were less upbeat about expansion this year, down from an average of 11.6 percent last year as a whole to 8.2 percent year-to-date in 2016. Economic conditions and the political climate were the most cited reasons for those saying it would not be a good time for expansion. Meanwhile, there was mixed news regarding labor markets. The net percentage adding workers in the past three months decreased from 3 percent to zero, and the net percentage planning to hire new workers in the next three months was unchanged at 10 percent. The hiring plans net percentage has averaged 10.5 percent so far in 2016, off from 11.8 percent in all of 2015 and a sign that anticipated employment growth has slowed a bit. Nonetheless, job openings jumped from 24 percent to 28 percent, which might indicate better hiring data moving forward. In a similar manner, the percentage making a capital expenditure in the past six months fell from 58 percent to 55 percent, a 17-month low, but future plans were more encouraging. The top “single most important problem” was a tie between taxes and government regulations, cited by 21 percent for both. The quality of labor (15 percent), poor sales (11 percent) and the cost and availability of insurance (10 percent) also topped the list. The University of Michigan and Thomson Reuters reported that the Index of Consumer Sentiment rebounded from 87.2 in October, its lowest level in 13 months, to 91.6 in November. Note that this is a preliminary figure, and it will be interesting to see how the final data, which will be released on November 23, are impacted by the election results. Overall, the headline index has averaged 91.1 through the first 11 months of 2016, down somewhat from the 92.9 average for all of 2015, and the data have trended lower since reaching 94.7 in May. Americans have remained somewhat anxious in their economic outlook, with respondents continuing to be concerned about income growth and weighing political uncertainties. Nonetheless, the data are largely consistent with real personal spending growth of 2.5 percent in 2017, according to the University of Michigan. In the November data, respondents were more upbeat about both current (up from 103.2 to 105.9) and future economic expectations (up from 76.8 to 82.5). The forward-looking measure bounced back from a two-year low in October.